The one in the dark case is 01 Sweet Espresso, which contained red and chocolate tones. The 02 Sugary Sweet is the one I got, and has pinks and golden shades. The outer box was a bit banged up from where Winners attached the security alarm contraption. At least I was assured that no one had tempered with the contents! A gift to myself, that is! 😉 When you open the lid, it reveals 4 little pots that look like little macarons! The Jar in Rouge is a clear lip balm that turns pink when it comes in contact with the warmth of your lips like a mood lipstick (it turns fuchsia on me!) But, the Lip Balm Jelly from the Sugary Sweet kit is just plain ol’ clear balm – no magic mood tricks here. It does, however, have 6 dots of colours (red and pink) suspended mid-layer in the jar – I didn’t have the heart to dig into the balm to fish out the blobs of colour for analysis. I assume they will provide a tint to the lips. I’ll just have to wait until I reach that layer to find out! 😛 The balm has the same silky texture as the Jar in Rouge – non-sticky yet long lasting on the lips. 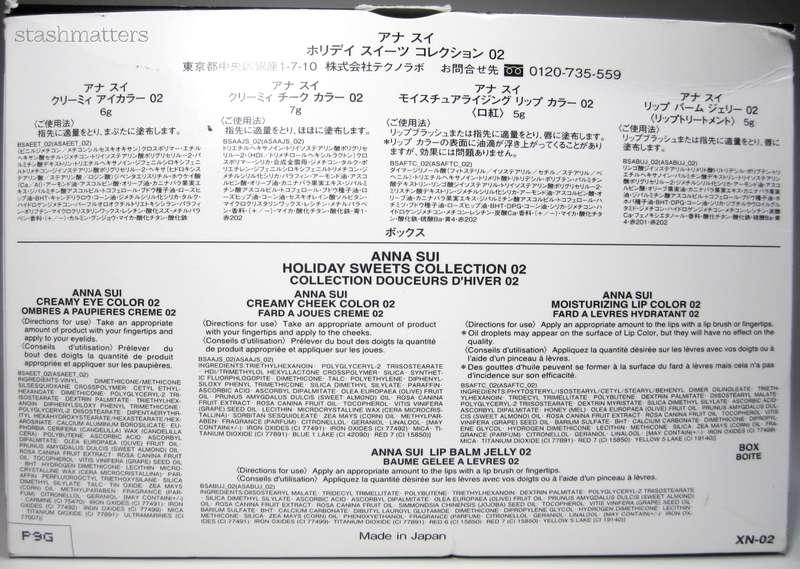 Detailed ingredient list – click to enlarge. Next > MyLipAddiction Beauty Podcast: Christmassy Chit Chat with Daniel the Jewellery Elf! I love Anna Sui brand concept, which is a fairy tale and dolly-like. But the products are just not my cup of tea. I love the fragrances, but it never lasts on my skin. I’ve had really good experiences with Anna Sui makeup so far! I love their powder eye shadow and blushes. Too bad these weren’t as good – it’s possible that the holiday sets aren’t as good quality-wise. The packaging is always so great! If there’s ever any Anna Sui stuff you are looking for, let me know, because I’ve seen it downtown at the giant Pharmacie Jean Coutu. I think it might be the full range. Oh man! I’m jealous! 😛 I hope they remain there at least. Perhaps the French-Canadian market is better than English Canada? Who knows! It isn’t carried at the PJC near me. Only the ones with the beauty galleries. It’s too bad you only like two products, but… how pretty is this? I know, I’m not even mad. The prettiness distracted me…. Can’t blame you! And it was basically half off so who could have resisted? I think I’d have bought it too! I find I’ve never been too intrigued by the Anna Sui line – I mean the aesthetic is very cute but somehow it doesn’t do it for me. Shame it’s being pulled from both HBC and SDM, though. I did notice a while back that Well.ca started carrying it. They might still but I guess it’s an online store. I’m not sure exactly why I’m drawn to AS stuff – I think it was partly due to the fact that they’re both girly and edgy with the black colour. And, normally I do find the quality to be really good. This is such an interesting brand! I’d never heard of them before coming across your blog, but everything looks so darn cute! Omgsh the packaging on these is to die for! Even if some of them didn’t work out that great, I still want it for the packaging. It would look awesome on a vanity haha! It’s true – more like a decoration than anything else. I wouldn’t have the heard to toss out even the ones I didn’t like! Omg, that packaging!!! The way the products look inside the pots kind of reminds me of products I would use as a teeny-bopper, most likely from Bonne Bell…especially that swirly lip gloss! Too bad only two of the products worked out. The cream shadow shades are SUPER pretty, it’s just a shame that they too slick. I was really hoping the eye shadows would perform well. They looked so pretty when freshly applied but after an hour they were already creasing! I think it is the curse of the holiday set! Yes, I’ll likely end up using that box for beauty stuff. Perhaps for hair stuff like clips and elastics. Always adore Anna Sui’s packaging. They’re really cute! I echo what Jodi mentioned in her comment that Jean Coutu downtown has them. I’ve seen them before. The blush looks pretty and pigmented. Thanks for the information! I’ve edited my post to reflect the fact that Jean Coutu still carries Anna Sui – yay! Haha what do you have in your closet!?! I actually bought this for my daughter last year from winners for Xmas! It is lovely and I love the packaging ! Anna Sui has everything looking so perfectly pretty. Love the packaging…am actually yet to try any products apart from the perfumes. I have a mini set of her perfumes. I’ve tried just about every perfume she offers but none of them compelled me to invest in a full size bottle. But I do love the packaging so the minis will have to do! I am a little sad that the pots are no longer perfect now! I might use a hair dryer to smooth over the lip gloss and eye shadow to see if I can get them perfect looking since I’ll never use them again. I don’t typically like cream blushes because they are sticky but not this one! I’m wearing it today and it’s perfect! Those little jars are so cute! I’ve always thought their packaging was fun and creative. Maybe you can use the box to store samples? Like those tiny perfume samples? I have a few cute MAC boxes that are shaped like that and I keep my perfume samples in them. Oh that’s a GREAT idea to use the box to store samples! I have a drawer dedicated to samples right now and I keep forgetting about them. Last year I took the time out to sort my samples according to type, so all moisturizers go into one baggy, all serums into another one. Thanks! This is such a cute set and I love the theme! I’m sad to hear you only liked 2 products. The presentation was great!! I’m a sucker for Japanese makeup packaging! Usually I love her products but I guess Holiday sets usually suffer from quality. I agree. The holiday sets do suffer quality.